Seems like everywhere you turn – magazines, TV shows about houses, conversations with friends – outdoor fireplaces are in vogue. It’s not enough anymore to have a patio or a deck with a gas grill at the ready under its plastic cover. Now you need a fireplace with chairs grouped around, a mantelpiece, and plenty of rocked surfaces. It cannot be denied that in those parts of the country where outdoor living is possible more than half of the year, an outdoor fireplace makes great sense. And even in the snow, a group of people can sit outside, roast marshmallows and watch the football game over the fireplace! How about a Christmas carol singalong while you are at it? Sometimes the fireplace is on a screened in porch; sometimes it is on the deck; sometimes it is in the backyard at a distance from the house. But how do you install one that is most effective for your family and friends and also increase the re-sale value for the home when it comes time to sell? 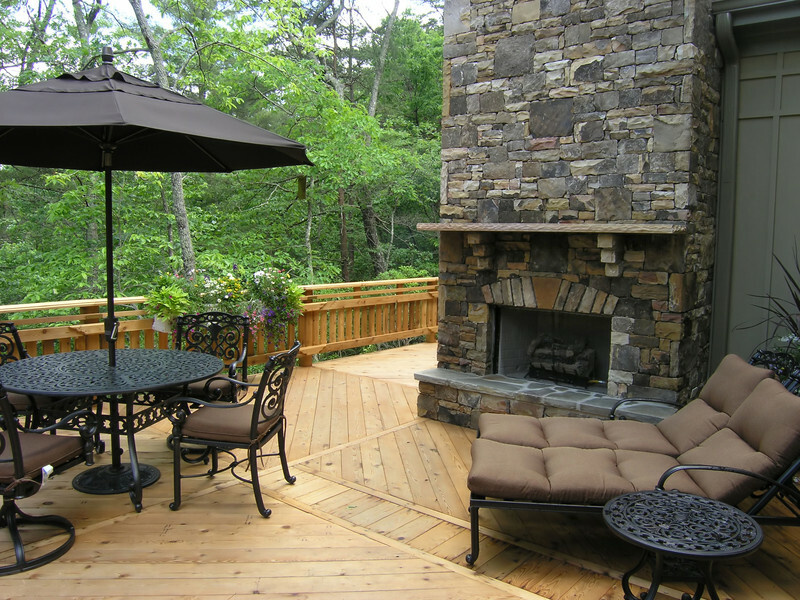 In Georgia, outdoor space adds tremendous value to a home. And the latest calculations rank Outdoor Fireplaces high on the list. Outdoors, screened-in porches provide the best return on your money, followed by a deck and then a patio. Beyond the outdoor constructed space, a level backyard is the most desirable. At Gosa Properties when we are doing a market analysis of a home, the outdoor/exterior space is an adjustment of from $10-20,000 depending on the degree of buildout. An outdoor fireplace is more than a Boy Scout fire pit though pits are valuable, too, for family gatherings and friends. When you have decided on a fireplace, the most impotant accessories to provide are the chairs that will face the fireplace. They can be rustic Adirondacks or cushioned deck chairs. Next in importance are a table and chairs for sharing a meal, a game of cards, or a round of Monopoly! If you can build into the fireplace a music source such as an iPod dock, it will enhance your experience. If not, then by all means, build in an electrical outlet or three for lamps, music or other cooking appliances. Indoor/outdoor rugs add coziness and a place for the cat or dog to snooze. The TV over the fireplace is an extra special feature but if you are building a fireplace, and you don’t want to add TV to your experience, add the wiring for the TV while you are building in case the next owner is interested. 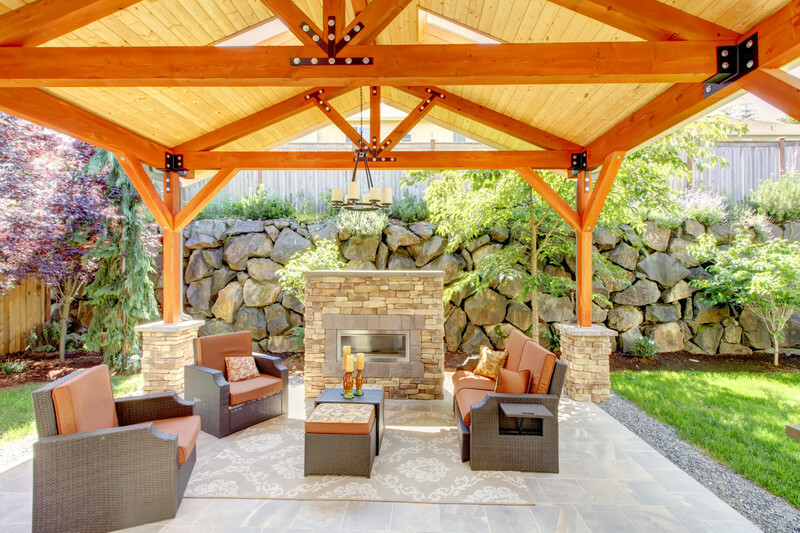 Think about outdoor fireplaces when adding new features to your home. Great article, we do not have a fireplace but we do have a fire pit and although I was never a big fan of marshmellows I do love the natural entertainment sitting around the fire brings. We spent the summer eating on the pool patio (where we will have an outdoor kitchen next year) and then moving out to the fire pit as it got dark. In our area, I haven’t seen much of the outdoor fireplace – but I imagine that’s because of the LONG WINTER! Thanks for sharing! Cheryl, great article, by the way. We have a Del Webb community of new homes here in my area that is offering fireplaces on the outside rear patio. They are very cool. It seems that outdoor living has taken a whole new turn.